Jess Hall’s dad is the new general manager at Porchester Park, and is moving Jess, her brother and pet cat into a staff apartment there. Jess is dreading the move, until she learns the apartments are strictly A-list only and soon to be populated by actors, musicians, models and millionaires…But fraternising with the stars isn’t all it’s cracked up to be, and soon Jess is wishing for a return to real-life – but can she admit to her friends that the gilded cage isn’t quite as golden as she’d anticipated? No you haven’t fallen into the wrong book blog. No I haven’t suddenly decided to start reading books I would have read as a teenager. But yes I don’t normally read young adult fiction, especially of the chick-litty type. I was given this book by somebody at work and when I found myself at work without a book I decided I’d dig this one out of my locker rather than attempting to read on my i-pod over lunch. When I was about 13/14 I went through a bit of a stage when I liked these types of books. 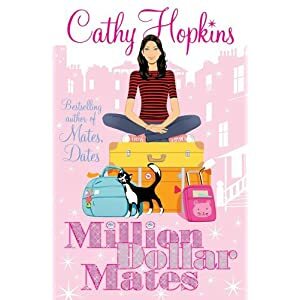 At the time I actually read one of Cathy Hopkins’ other series, “Mates, Dates and…” (or what was released of it at the time). At the time I did enjoy those books, although they weren’t my favourite of the type (they would probably be the Louise Rennison books, which I still remember fondly) and there is little about them not that sticks in my mind. As with the Mates, Dates series this book had a certain level of emotion in it (In this one the main character’s mother had died, in the mates dates it was more everyday teenage matters), although that wasn’t the overwhelming theme. Generally in fact I found it pretty shallow. Maybe I would have found the characters meaningful as a teenage but not now. Even then I did prefer books hat had somewhat of an issue, gave you something to think about, and this one really didn’t.